Hot banana peppers. You can purchase them pickled by the jar, or pickle your own. I’m feeling nostalgic again this morning. I love my life at present and all those who are in it, but every once in a while the mind floats back in time to fond memories and friends who have moved on, or passed, away. There’s comfort in those kind of thoughts. Almost a warmth and peace, like sitting at a window and watching the sunbeams dance on the floor. It’s in these times that I wish to be back then, in some way. 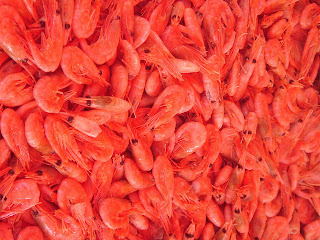 Although I cannot bring back the people I can try to bring back the food that is sometimes part of those remembrances. So with those memories in mind, I offer you another instalment of my “cooking from memory” recipes. Many years ago when I was attending the Nova Scotia College of Art and Design I lived on Cogswell Street in an old Victorian duplex. 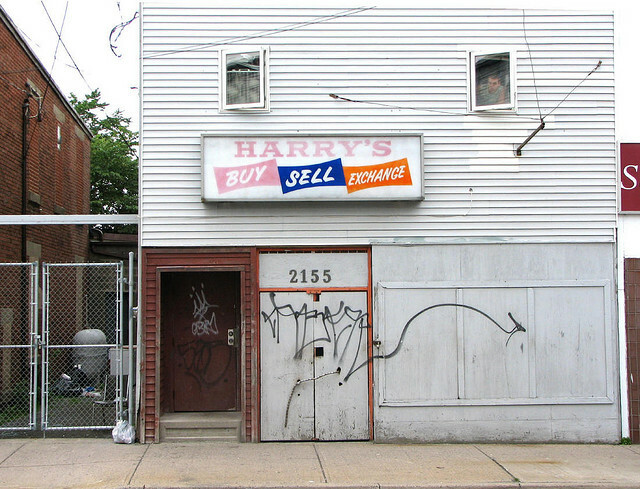 Half was a rooming house (with an assortment of the underemployed); the other half was apartments. These apartments were no beauty spots if mine was anything to go by. There weren’t many benefits of living there except it was close to college and the rent was cheap. Besides the proximity to “evening entertainments” there was really only one other plus. 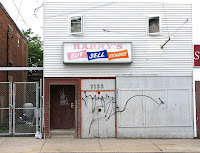 That benefit was a hole-in-the-wall pizza joint just up around the corner on Gottingen Street. It was a little scary to go to at some times of night, because at the time that particular neighbourhood wasn’t one of the best in Halifax. Though, after a long day’s labour in the design studio mines sometimes I just didn’t want to cook. So up I would go. Their menu was OK, except for one pizza in particular which was stellar. It was pretty run of the mill for the most part. 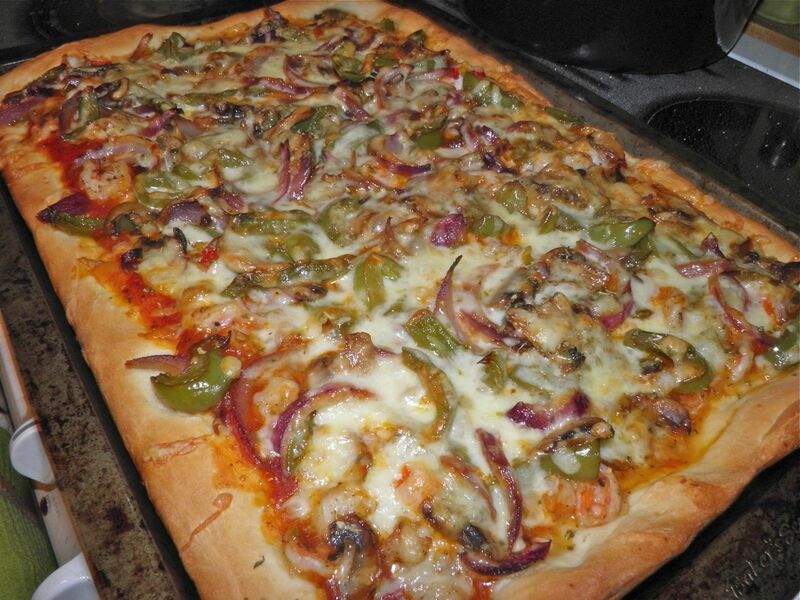 Sauce, onions, mushrooms, green pepper… and then it had white cheddar cheese, prawns and hot banana peppers. That was different. And tasty. The pickled peppers and sweet prawns were a combination that was entirely unexpected. Sadly the pizzeria has long since gone (as well as my favourite bar on the same street), and with it that pizza. That pizzeria was the only place I have ever seen it offered. I’ve thought about that pizza off and on in the intervening years, inextricably intertwined with thoughts of my time living in that apartment. Tonight I got a craving and I thought I would try to replicate it. It’s not exactly like what I remember, but it’s more than “close enough.” For example, prawns are almost impossible to get in the grocery so I substituted shrimp. 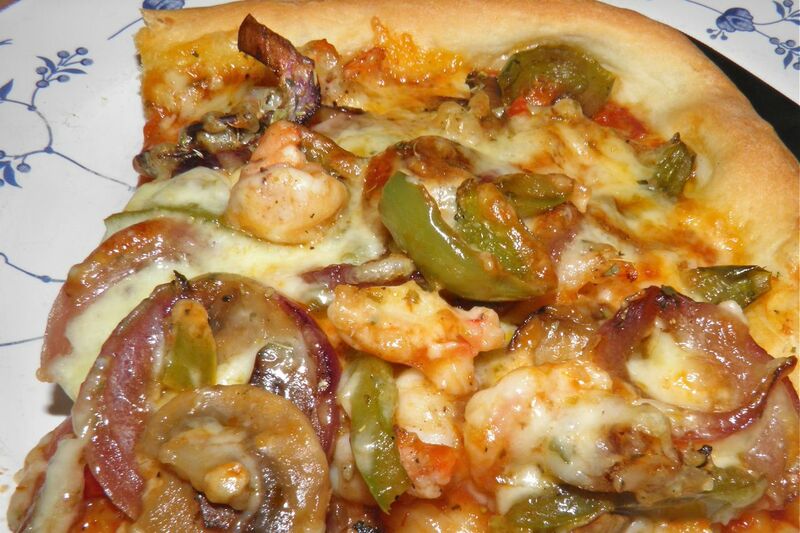 The pizza itself isn’t very hot from the peppers, so take the jar to the table so people can add fresh ones on top. I think uncooked peppers on top is the secret. That’s where the real “zing” is in this recipe. I have also thrown in a brown sugar pizza crust, just for good measure. I hope you enjoy it. Mix the yeast, water and sugar in a bowl. Let proof for 15 minutes until the yeast is frothy. After the yeast is proofed (if it doesn’t start again…) stir in the salt and olive oil. Then add the flour and mix well. Knead for a few minutes in the bowl. Then cover with plastic and a dish cloth* and set in a warm place to double in bilk, about 1 hour. * I always use a plastic grocery bag. I place the bowl inside and tie it tightly shut. The idea is to keep the moisture inside with the dough as it rises. The cloth keeps it in the dark, which is also necessary. After the dough has risen, put it on a greased pan (12x18) and pat it out to the edges. let it rise in the pan while you prepare the toppings. Heat the olive oil in a large sauté pan. Add the mushrooms and cook until they begin to brown. Season with half the salt. 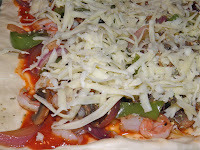 Then add the green pepper and onion and let cook until softened. Remove to a bowl. Don't forget to add peppers to the top! 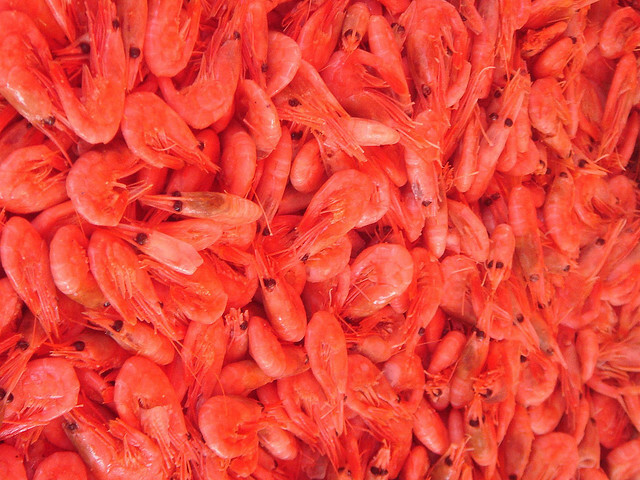 Throw the shrimp in the same pan. Season with the remaining salt and the 2 tsp cracked black pepper. If using ground pepper, use 1 tsp. Dimple the crust with your fingertips to deflate it a little. 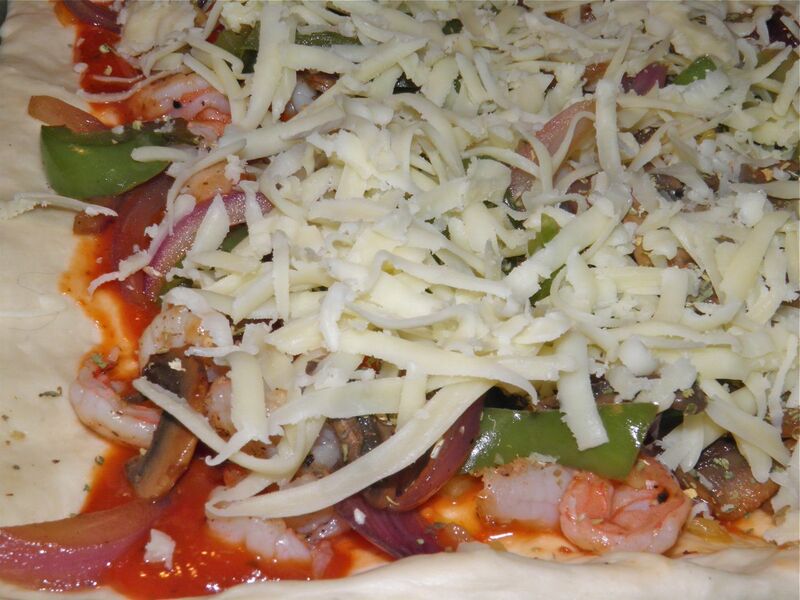 Then add the pizza sauce and smooth it out over the crust. Then add the shrimp on top, followed by the banana peppers. Sprinkle with the oregano. Distribute the vegetables on top and then scatter on the cheese. I advocate cubed cheese for on pizzas, but I’m replicating a recipe I remember so in this instance I grated it. Normally I would… And this pizza would probably be better if I did. Cubed cheese doesn't allow the "steaming" of your toppings underneath it. Bake in the centre of the oven for 20-25 minutes or until the cheese is golden and bubbly and the crust is browned on the bottom. 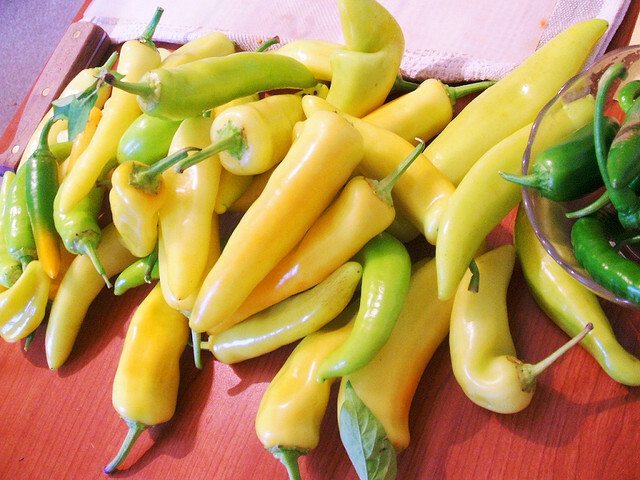 Don’t forget to bring more banana pepper rings to the table.